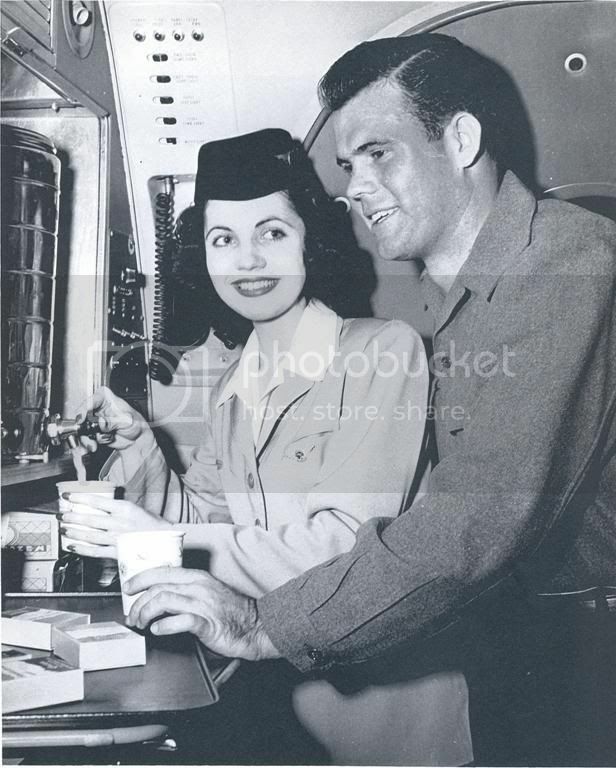 TWA also trained Braniff's first "Hostesses" who were to serve coffee and attend to the passengers. Most were registered nurses and knew CPR. The first uniform was a modified Mexican Style outfit, and consisted of a bolero jacket and a silver grey wool skirt and white blouse. This was comlimented by a red sash and a "softly draped" red wool crepe turban. The skirt was designed by Neiman Marcus. Fort Worth, home of this website, was Braniff's "hub" of operations in 1936. Passengers flying North from Brownsville, San Antonio, Austin and Waco would change planes for Westbound (Wichita Falls, Amarillo, Los Angeles...) flights or Eastbound (Dallas, Atlanta...) This also was true for Southbound flights from Chicago, Oklahoma City and others. Braniff flew from Fort Worth to Dallas, Houston, Oklahoma City, Waco or Wichita Falls (with connections to Amarillo). Passengers to the West or East coast would board American Airlines flights at Fort Worth. In 1937, 10 out of 800 applicants were chosen. The criteria: Female, at least two years of college, fluent in Spanish, people skills, a pleasing personality, neat and clean appearance, aged 21-26, 5'0 to 5'4" tall, 110-118 pounds and unmarried. Irene Martinez with a DC-2 "B-Liner"
The Second Hostess class consisted of three more girls: Dorothy Dreyer, Louise Jenkins and her twin sister Sissy. Braniff's Lockheed Electra 10 on a 1939 Timetable. A letter from co-chief-hostess, Willie Peck to The Dean of a School. In the 1930's the Braniff Airways logo consisted of a circle logo with the new DC-2 aircraft over pictures of possible destinations. Braniff would also use this logo scheme pictured to the right with the DC-3 and Lockeed 10 in the circle. In 1939, Braniff added the most famous aircraft ever built to its fleet, The DC-3. The DC-3 was a complete redesign of the DC-2 by Donald Douglas and American's C.R. Smith, who needed an aircraft to replace the crowded Curtis Condor sleepers and an aircraft that could carry enough passengers, so that mail was no longer a crutch for the airlines. At this time, Braniff used this design with the DC-2 and the Lockheed Electra 10 in addition to the DC-3 Super "B-Liner". In 1939, A Douglas DC-2 (the First one delivered to Braniff) crashed in Oklahoma City (Tail number N13727). Captain Claude Seaton and First Officer Malcolm Wallace were at the controls. They survived, but Hostess Louise Zarr did not. (source "The Clipped B's, Herb Oberman and Jeff Wilkinson - Oklahoma Wreckchasing) Captain Seaton retained injuries that kept him grounded, but he went on to be one of Braniff's best flight instructors. Despite the many perils of the early years in aviation, many airlines (including Braniff) printed brochures to convince passengers not to worry. In 1940, Braniff celebrated its 12th Birthday. Budding stars like Rochelle Hudson, Ann Miller, Gloria Dean and John Wayne were on hand for the gala affair held in California. All Braniff planes used in WWII were decorated with a taped "V" for Victory over the company logo. When America entered World War II, Braniff, like most other airlines, turned its efforts to the War. However, unlike most carriers, Braniff ran "cargo" and other things to Panama and Guatemala (with points in-between) starting 13 April 1942. They ran this DC-2 and DC-3 service out of San Antonio. It was dubbed affectionately, "The Banana Run." It was officially called "The Contract Air Cargo Division of the Air Service Command." This was, for a time, the only source of re-supply for the Panama Canal because of the threat of Nazi (German) U-Boats prowling the Gulf of Mexico which made shipping by sea dangerous. In the summer of 1942, dozens of U-Boats made their way into The Gulf of Mexico. One has been found, U-166...but researchers have found another recently (2004). The Pilots on Braniff's "Banana Run" faced real dangers, as ships were sunk at an alarming rate off the Texas Coast. Rare Letter from Tom Braniff thanking a passenger for flying from Fort Worth to Dallas! Rare 1945 ticket from Austin to Dallas on A DC-3 "B-Liner." At this time, Braniff had not recieved all its planes back from the war department. So this lucky traveler got a rare seat. On April 4, 1945, Aerovias Braniff Incorporated in Mexico City. It was a division of Braniff Airways, Inc. (just like Panagra was a division of Pan Am). The Airline flew DC-3's throughout Mexico and Central America linking the U.S. Braniff to South America. It inaugurated service from Nueva Larado to Mexico City, and on July 1, 1945 Mexico City to Merida via Puebla and Veracruz. Pan American World Airways, of course, didn't like this and used its U.S. government connections to influence the Mexican Government to shut the airline down in 1946. "Temp. permits were cancelled by the Mexican Government on October 27, 1946" - 1946 Braniff Annual Report. Tom Braniff was at the inauguration of this short-lived Mexican subsidary. At this time, Braniff was promoting it's new DC-4, and post-war prosperity. 1946, and the war was over. Braniff, with Tom and Chuck Beard firmly in control of its fleet again, made plans to open routes to South America. From their Dallas offices, Tom and Chuck drew out the routes they wanted. That same year, the CAB granted Braniff the rights to fly to our Southern Continent, thanks to President Truman who didn't like Pan Am's monopoly in South America...and Braniff Airways became Braniff International Airways. Future Senior Vice President of Contract Services and Corporate Director during the 60's, Reginald "Rex" Brack is promoted to General Sales Manager in August of 1947. He had joined Braniff in May of 1944 as a district traffic manager in Kansas City. Like Tom Braniff, Mr. Brack owned his own insurance company prior to signing on with Braniff Airways in Kansas City. Brack would leave the company in 1969 after being fed-up with the "Lawrence Posse." Rex Brack, R.V. Carelton and Dan Hughes were some of the original Braniff people who kept Lawrence in check as long as they could stand Lawrence's n'pals excessive spending and alleged coruption. In 1947, the "breakthrough" airliner, The DC-6, was delivered to Braniff. The DC-6 was the first pressurized airplane able to obtain altitudes greater than 18,000 feet, and at a speed of over 300 MPH. Braniff used these on their new South American routes in sleeper configurations. These planes also had lounges for passengers to meet. Braniff flew the DC-6 via Havana, Cuba to Brazil, and then in 1949, Braniff initiated "El Conquistador" service to La Paz, Bolivia, and the next year, Buenos Aires, Argentina was added. This gave Braniff 20,000 miles of International Routes from Houston to Buenos Aires. Braniff's South American Route System...it was linked from Dallas via Havana, Cuba (This map only shows part of Braniff's entire route network). South American Brochure..linked from Dallas via Havana, Cuba. Braniff Airways International Cap Badge. Tom sent Chuck down to Argentina. This time to meet with Jaun's self-made "star" wife Eva (Evita) Peron to try again. She said, "Braniff can fly to my city, if I can fly on Braniff free to Houston and Dallas to shop at Sakowitz and Neiman-Marcus, and return home duty free." The rest is history...the ceremonies took place at "Casa Rosada" (The Pink Palace in Buenos Aires), and Braniff was flying to Argentina with an occasional non-rev on board. Sing to "Don't Cry for Me Argentina"
From Oklahoma to the World. In 1948, Braniff was 20 years old. They had advanced from a one-route, one airplane part-time mail route airline to an International powerhouse flying from the border of Canada to the Southern Tip of South America. DC-6 service in the U.S.The "Texanaire". Mid-Continent started in 1930 as Hanford's Tri-State Airlines. They rapidly expanded in 1934 with new air mail contracts to incude Winnepeg. In 1938, Hanford changed its name to Mid-Continent, and it flew DC-3's during the War and for the War. The five Convairs 240s were added in 1950. On August 16, 1952, Braniff aquired Mid-Continent Airlines and its fleet of Convair 240's. Also Braniff acquired some L-188 "Lodestars." Braniff aquired Minneapolis/St. Paul, Sioux Falls, Sioux City, Omaha, Des Moines, St. Louis, Shreveport, and New Orleans in the merger. In 1953, Braniff introduced the "Super Convair 340." It was to replace the aging fleet of DC-3's and could carry twice the number at 44 passengers, and at a speed of 300 MPH. The photo at right is of a Braniff Convair at Fort Worth's Amon Carter Field (just south of the present D/FW Airport) The Airport was closed in 1972 to make way for D/FW. All that remains of Amon Carter Field is the end of the main runway on Amon Carter Boulevard - now home to American Airlines. In January of 1954, Tom and a few of his buddies were traveling for a duck-hunting and fishing trip near Shreveport, LA. in a Grumman Mallard amphibian private plane...the plane crashed and all on board, including Tom, were killed. The era of Braniff leadership was over. Six months later, in June, Paul died of Bone Cancer, and in August, Bess (Tom's wife) also died of Cancer. Tom and Bess' only son, Thurman Braniff died on July 11, 1938 in a private plane crash as well. He was learning how to fly. Jeanne Braniff, their daughter, died of phlebitis with phlebothrombosis (complications during child birth) on Jan 9, 1948. Her baby Jeanne Terrell was born on November 17, 1947 and died on November 18th. Only Paul's son, John Paul survived to carry on the Braniff name. Braniff was officially started in 1928 and ended in 1982 (28-82 flipflopped numbers) Paul, Tom and Bess died in 1954, the airline was 54 years old when it shut down in 1982. Marie Braniff, Paul's wife, was the daughter of railroad contractor R.W. Mainey; her uncle, Father Gregory Gerrer established the "Gerrer Collection" at St. Greggory's Museum in Shawnee, Oklahoma. The webmaster of this site, Mr. Brooke Watts' grandmother, Annabelle Watts-O'Neal is honoured in that museum for teaching four generations of Shawnee youth. Braniff Airways Logo 1936 "Friendly Transportation"
Braniff Uniforms were made in Dallas in 1937. In the 1940s, Airlines named their routes with colorful names. Braniff Pilots with DC-3 allocated for war service. Notice the "V" on the nose for "Victory"
To South America from the U.S.
Mid-Continent and Braniff Airline Chiefs meeting in front of a Braniff Convair. Braniff Convair 340 at Fort Worth's "Amon Carter Field." Fort Worth legend, Amon Carter, hated Dallas. airport right on the Tarrant/Dallas county border. This was one year before Tom and Paul Braniff's death. The photos on this page are provided by: Pat Zahrt, Marie Braniff, John Paul Braniff, Sr., George W. Cearley, Jr., The Dallas Historical Society, The "Daily Oklahoman" UTD, Carmina Danini - San Antonio Express News, John Paul Braniff, Sr., Mo McMahanon, John McFarlane, Wanda Brown, Diane Muse, C.R. Smith, Chuck Beard, Marv and Carol Degrute, Geza Szurovy, The Braniff Family and Watts Communications' Private Braniff Collection.